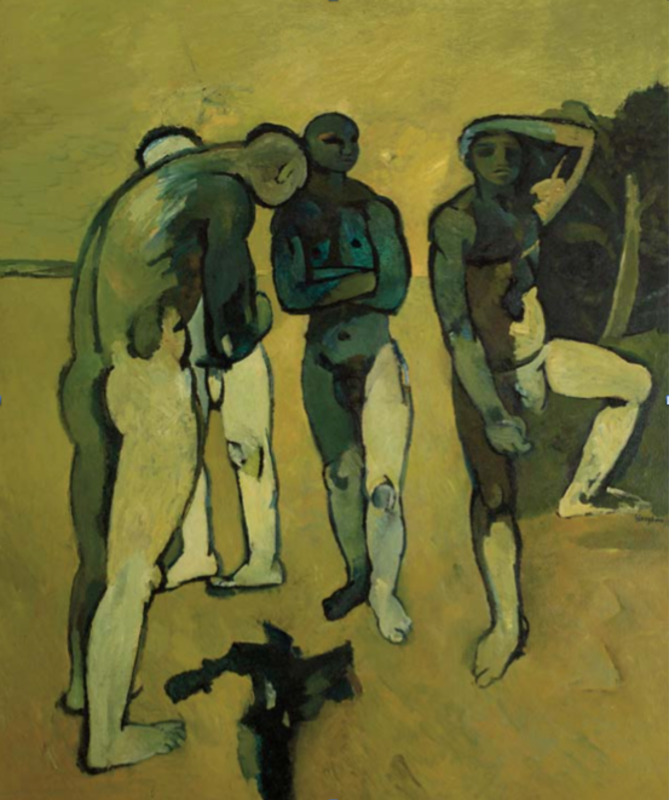 The four naked figures seem to have congregated for no other reason than assembling, since we are offered little evidence as to why they may have come together. They are inactive and inert, awkward and confused as they stand in the blinding, unforgiving sunshine. Somehow they have been dropped into a wilderness at the edge of a woodland or, perhaps, a beach and are understandably vulnerable and confused. A head is scratched, a body is bent over and a nervous self-embrace communicates something of man’s insecure circumstance. A characteristic of Vaughan’s ‘Assemblies’ is that the human figure, despite physically belonging to a group, remains psychologically isolated. That is certainly the case here. This anxious collection of individuals, huddles together to confront both climate and environment. The largely monochromatic colour scheme assists in uniting the disparate figures and marries them to the quality of the landscape. The pigment, thickly applied and somewhat stiff, is characteristic of Vaughan’s work of the first few years after the war; he had been deprived of a studio while in the forces and, because of regulations and rationing, had not been able to use oil paint. Here its tactile quality operates as an equivalent of flesh. One evening, in the autumn of 2002, I discussed this painting with Professor John Ball, who owned it at the time. I showed him some of Vaughan’s landscape photographs taken with the sun behind him and, as a consequence, his shadow can be seen falling into the picture space. We concluded that the foreground shadow in the First Assembly of Figures could function similarly, as a reminder of the painter’s physical proximity and psychological presence, as though he too was a member of this apprehensive assembly. John also pointed out that it could also be the shadow of the viewer, an idea which would carry the implication that we are also marooned in this desolate landscape along with the four depicted figures. On his death, he bequeathed the painting to the University of East Anglia.